Laerdal&apos;s MediCool Kit allows for clinically effective and mess-free cooling of a patient/casualty. There is another way to cool patients which is clinically effective and mess-free. 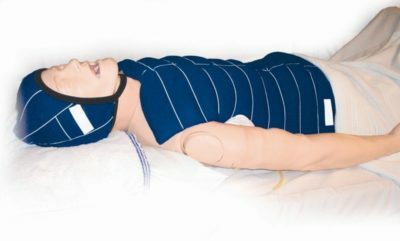 Designed by a nurse, Laerdal MediCool is a simple, skin-safe treatment to induce therapeutic hypothermia for improved neurological outcomes for the sudden cardiac arrest patient. Laerdal MediCool is an external fabric cooling aid which contains a water absorbing co-polymer. When frozen, Laerdal MediCool acts as a ‘skin-safe’ method for effective patient cooling via conduction, convection and evaporation. The Laerdal MediCool Kit includes 2 colour coded sets each comprising of: 1 blanket, 1 cap, 2 groin pads and 2 axilla pads. Travel pack available to allow pre-hospital use. The invaluable support at short notice of Eagle Training Services in the provision of volunteer first aid services, ensured that our 2008 event was able to proceed and that both our competitors and spectators were cared for by trained and experienced people.